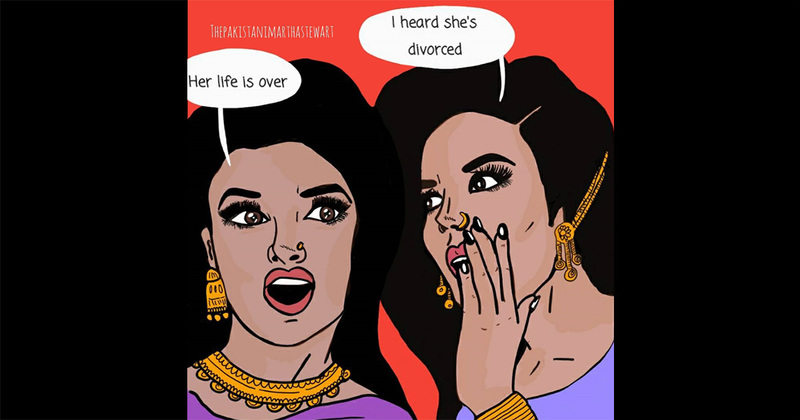 Divorce is looked upon as a taboo in South Asian societies. But men who divorce don't face the same barriers that women do from their family, friends and community. Rather, women face the blunt of the blame for any shortcomings in the marriage. "She should think of the children"
"She's already spent so many years with him now, what's the point of divorce now?" "Who will marry her now?" "Now she will be her parents burden"... and so much more. No one blinks an eye when a divorced male moves on to remarry or move on with his life. However when a female tries to do so, she is scrutinized in all aspects of her life, any decision she chooses to make to move on. The problem also stems from our societies fantasizing marriage as a sacred rite, which must be upheld even in the face of all sorts of compromises. Compromises which are put as a burden on a woman's shoulders most of the time. He cheated? He abuses you? He doesn't care for you? He doesn't support you? Just forgive him, where else will you go? It never ends. The suggestion is always the same. Just stay, compromise, there is no other option. If a woman decides to divorce a man and move on from her marriage, it is no business of yours what she is doing with her life now. Whether she wants to remarry, whether she doesn't remarry, whether she works, or goes back to school or lives with her parents. It's none of your business. Your backwards comments dressed as fake sympathies are helping no one.